We report a case of intentional oleander ingestion. A 21-year-old female was admitted in the emergency room with vomiting and lightheadedness 15 hours after ingestion of common oleander aqueous leaf extract (10-20 leaves). She had been advised to take the extract in order to conceive a baby. The patient was a non-smoker and non-alcoholic. She had no drugs allergy and was mentally sound. On initial examination, the blood pressure was 122/80 mmHg with irregular pulse of 46/min. She was looking toxic due to excessive vomiting. Other general physical parameters were normal. Her chest and lungs were clear to auscultation and percussion. 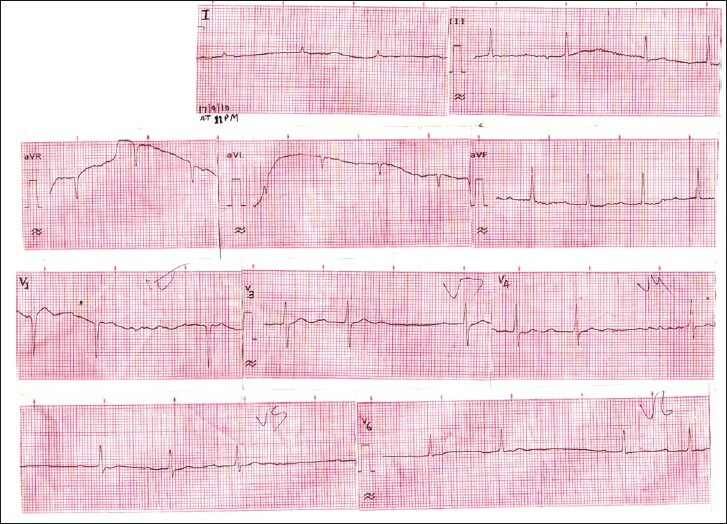 Cardiovascular examination revealed an irregular rhythm with soft S1and normal audible S2 over the cardiac apex. 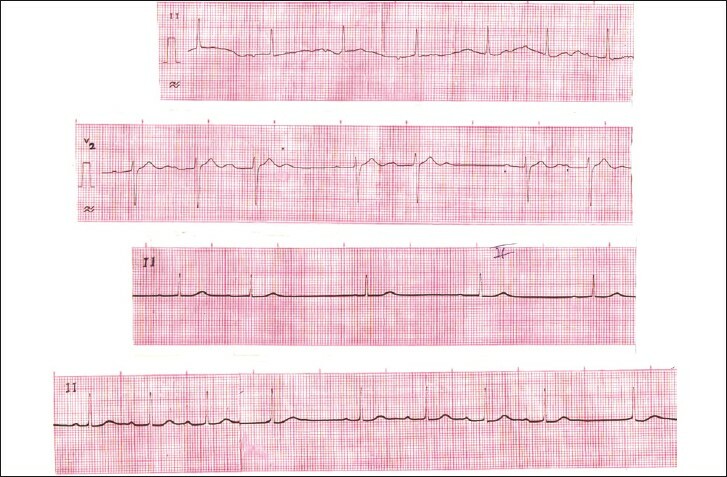 Electrocardiogram revealed inverted P wave in inferior lead and prolonged PR interval (.28 s), with varying degree AV blocks and normal QRS duration [Figure 1] and [Figure 2]. The patient was given .6 mg of intravenous atropine sulfate which did not resolve her bradycardia, but other symptoms were improved. Next day, the patient was given intravenous atropine sulfate. 6 mg twice a day and tablet orciprenaline 10 mg three times a day. After three days, the patient was discharged on request, with sinus node dysfunction and varying degree AV blocks [Figure 2] but asymptomatic. It is interesting that oleander poisoning can be fatal with relatively small amounts ingested. Osterloh and associates calculated the lethal oleander leaf dose of their patient to be approximately 4 gm. Practicing physicians should understand the potential lethal properties of oleander and its availability throughout the world. 1. Frohne DP, Fander HJ. A colour Atlass of poisonous plants. London: Wolfe Publishing LTD; 1984. p. 190. 2. Ansford AJ, Morris H. Fatal oleander poisoning. Med J Aust 1981;1:360-1. 3. Osterloh J, Herold S, Pond S. Oleander interference in the digoxin radioimmunoassay in a fatal ingestion. JAMA 1982;247:1596-7. 4. Shumaik GM, Wu AW, Ping AC. Oleander poisoning: Treatment with digoxin- specific Fab antibody fragments. Ann Emerg Med 1988;17:732-5. 5. Behcet Al, Yarbil P, Dogan M, Kabul S, Yildirm C. A case of non-fatal oleander poisoning BMJ Case Reports. 2010. 6. McEvoy GK, Litvak K, Mendham NA. Drug Information 88. In: Bethesda MD, editors. American Hospital Formulary Service. America: American Society of Hospital Pharmacists; 1988. p. 764-71. 7 Isolated Compounds and Cardiotonic Effect on the Isolated Rabbit Heart of Methanolic Flower Extract of Nerium oleander L.